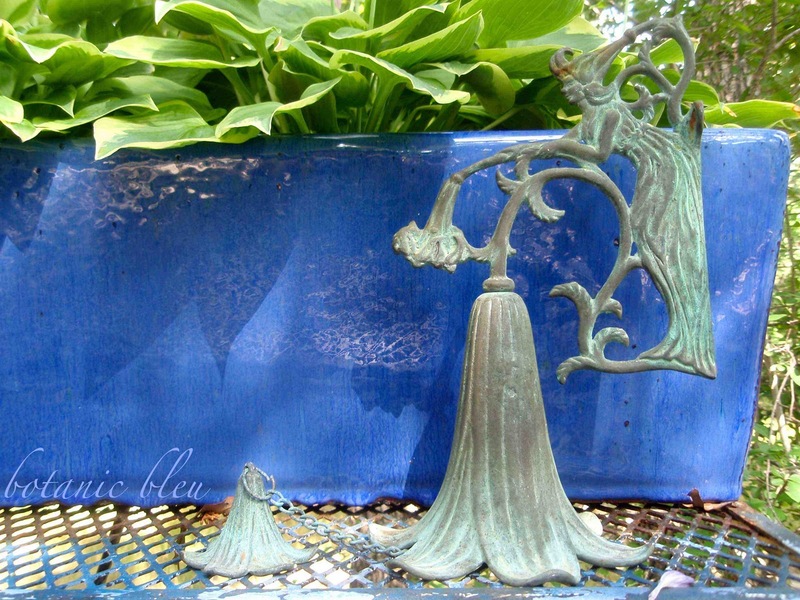 above their greenery and the garden fairy bell. Cool breezes blew from the north across the east deck. 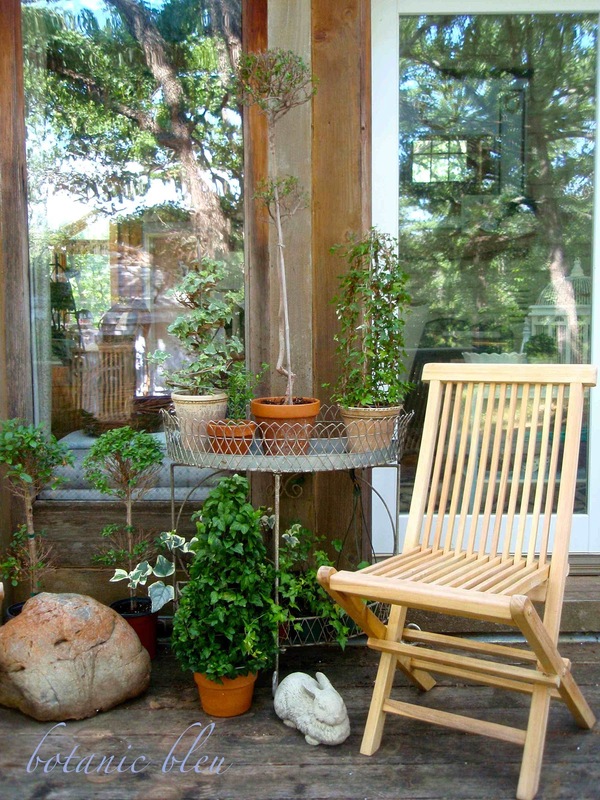 rejuvenating ivy on the bottom shelf is perfect for outdoors. for birds, cats, and wildlife that live in the woods around our house. to the garden shed with a French-style blue roof in the east yard. This May the view was especially lush with green plants and trees. a white Shasta daisy plant. I think I now know one of the reasons. flowers weren't brought to Europe until 1730. Oh, what a lovely spot to relax and enjoy your pretty plants. I adore those chairs and all the topiaries. Makes me want to make a trip to HG. '-) May was absolutely perfect here too! So soothing, relaxing, and so French! Love this little wire table-such a darling piece! Looks like a lovely place to sit and sip a cool drink and read a book or visit with friends! 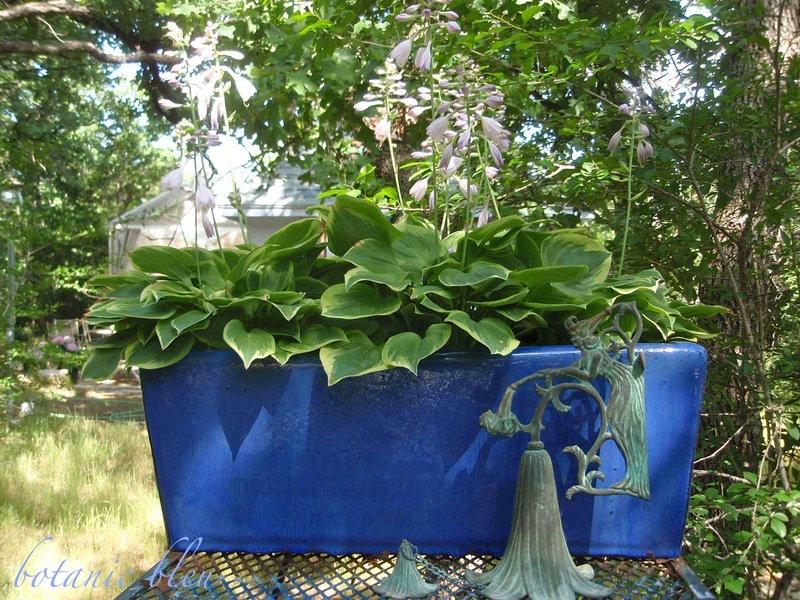 Love the Hosta! We had them in Alabama, sadly, the deer loved them as much as I did! One day we would have a lovely bed of Hosta and the next -- nothing but stems! 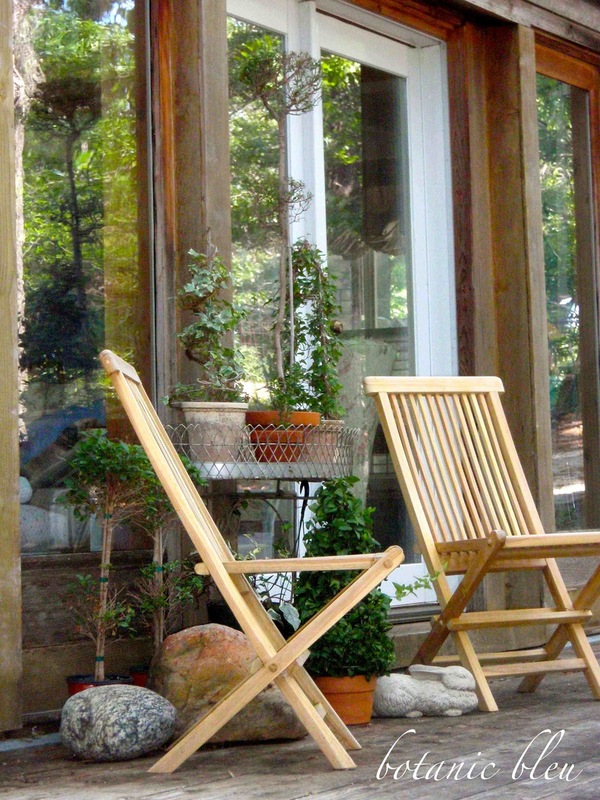 Love the French look of your deck. Hope June treats you as kindly! We have had at least one 109 degree day so far this week! Your deck looks so nice, and I love the fairy bell. I have a thing for fairies, you know. It looks like you live in the country? We are deciding whether to move to the country or stay where we are. The country always gives me peace. 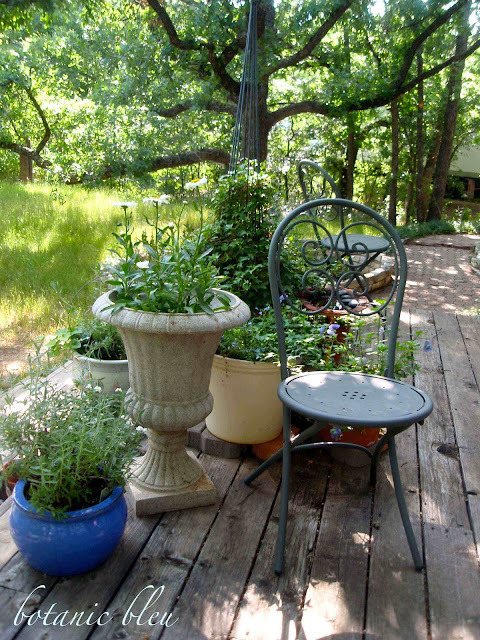 Your plants that surround the deck are so pretty. What a beautiful view you have and a lovely deck you've created from which to enjoy it! Your yard and sitting areas are just heavenly! What a heavenly spot. It does remind me of the French countryside. I used to love the vibrant colors in the garden, but since I switched to the milder color palette of the whites, blues and pinks the garden is so much more restful. Enjoy your garden. It is beautiful. If I hadn't known that you lived in the US, I would have sworn that this green and serene space, with its potted petals and woven wired jardiniere was, indeed, embedded in the French countryside! Hope you are taking in the sights, sounds and scents from your lovely deck this weekend! Thank you for joining Home Sweet Home. So charming~ your sitting area and yard are gorgeous. Thanks for linking up at Feathered Nest Friday! 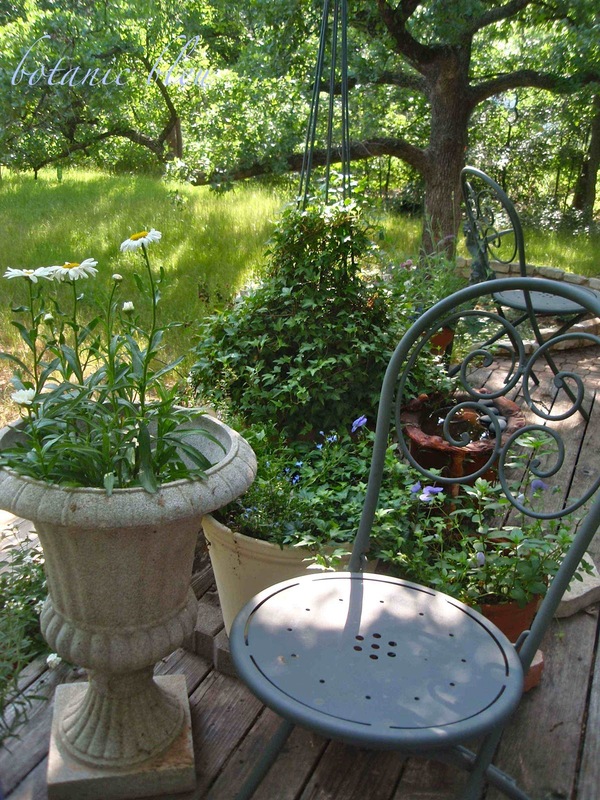 Judith, you've certainly brought the essence of French country living to your surroundings. I was interested to see so many perennials in pots and the number of pretty topiaries you have. 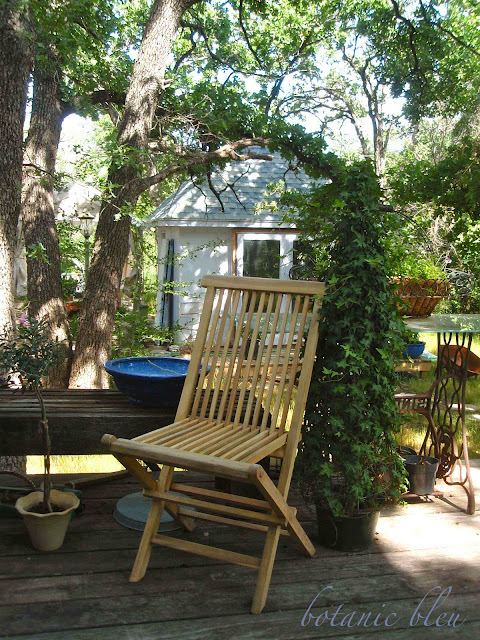 Your chairs look comfy and the term 'balmy' is something I look forward to for our summer. 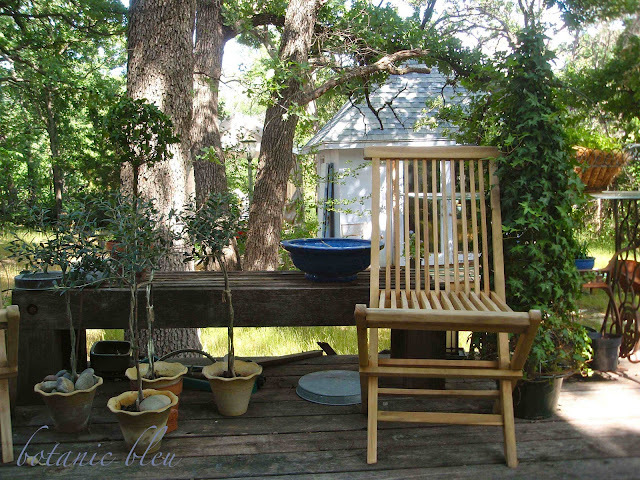 What a sweet spot to sit and drink Tea and laugh with family and friends...just lovely! Your French themed space is just lovely. Or should I say: J'adore les chaises et les fleurs! 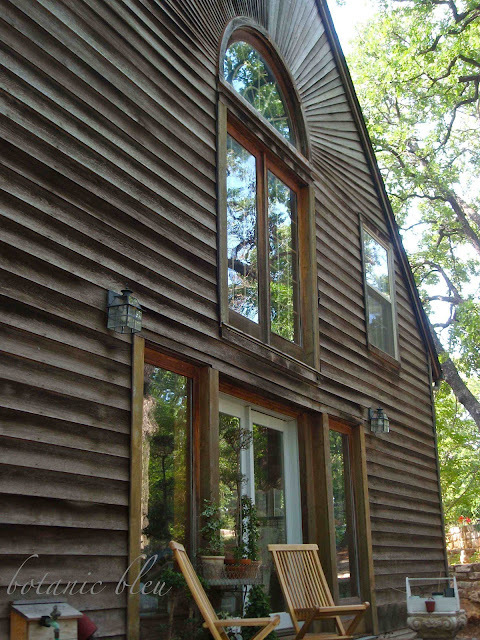 I'm visiting via Fishtale Cottage. 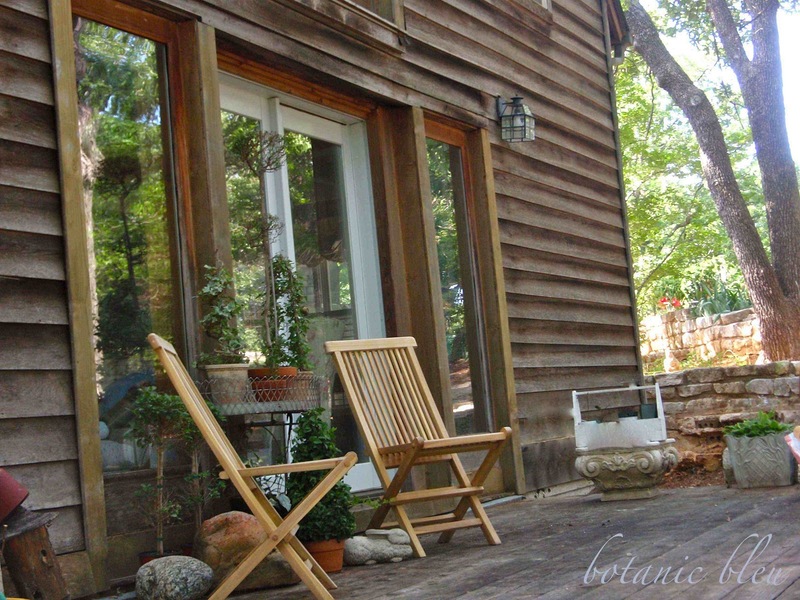 Your deck looks like such a great retreat! oooh...loved your blue door post too. I enjoyed the tour of your deck and gardens. So lush and beautiful! I hopped over from Dwellings feature and became a new follower! Gorgeous!!! You've made the top three!!! Woo Hoo!!! Featured on A Stroll Thru Life! So proud to know someone with such a flair for decorating; both inside and out! Love it!